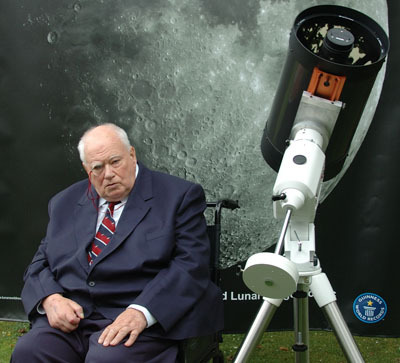 Sir Patrick Moore kindly let us use his garden for the evening, and came out to spend time discussing Moon craters with Nick Howes. He also hosted the Guinness World Records presentation event. Amateur observers have always been to the forefront in studies of the Moon. Indeed, it is true to say that before the Space Age almost all the best work in lunar cartography was carried out by amateurs. Of course the situation is different today, with lunar probes, but amateurs still have a role to play, and this mosaic produced by a group based in South England, is something entirely new. 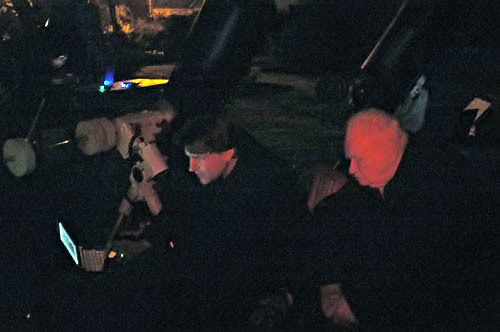 On 4th April 2009, a team assembled at my Selsey observatory. There were several telescopes, and each observer had been allotted a specific area of the gibbous Moon; the weather was kind (Selsey weather generally is!) and the photographs were taken. There were also five extra observers at different sites. This was only the start. Fitting the images together to produce the complete mosaic was a tremendous task, and took many, many hours. Well - here is the result, and I think you will be taken aback at the quality of the definition. This is by far the largest mosaic of the Moon ever produced by amateurs; could professional observers do better? I doubt it. Congratulations to all members of the group. They have produced something that is both artistic and scientifically valuable.